There is an abundance of winter squash and pumpkins around at the moment, some so beautiful to look at that you hardly want to cut them open. Their names are equally lovely - Baby Bear, Butterball, Jack Be Little, Sweet Dumpling and Turk's Turban to mention just a few. They are easy to grow and if you're short of space you can grow them up a wigwam of hazel sticks instead of horizontally. The seeds can be planted straight in the ground once frosts have passed. They need less water than summer squashes as they develop a good root system, and as they have hard skins they can be harvested in autumn and kept well into winter. If you are planning to keep them a while, make sure you leave a good length of stalk when you severe the fruit from the plant to prevent rotting. Squash generally have a better flavour and texture than pumpkins. Butternut squash has a rather boring flesh-coloured appearance by comparison, but it has a delicious nutty flavour and it's easy to find in the shops. It also, mercifully, has quite a thin skin so it is possible to peel one without slicing a finger, unlike some, if you don't want to roast it skin-on. Its firm flesh works really well as a filling for ravioli. Toss chunks of the squash in olive oil and bake in the oven with a few sage leaves to allow the natural sugars to caramelise and the sage to crisp. Mash the ingredients together to a firm puree. If the mixture is very stiff, you can let it down with just a little double cream. 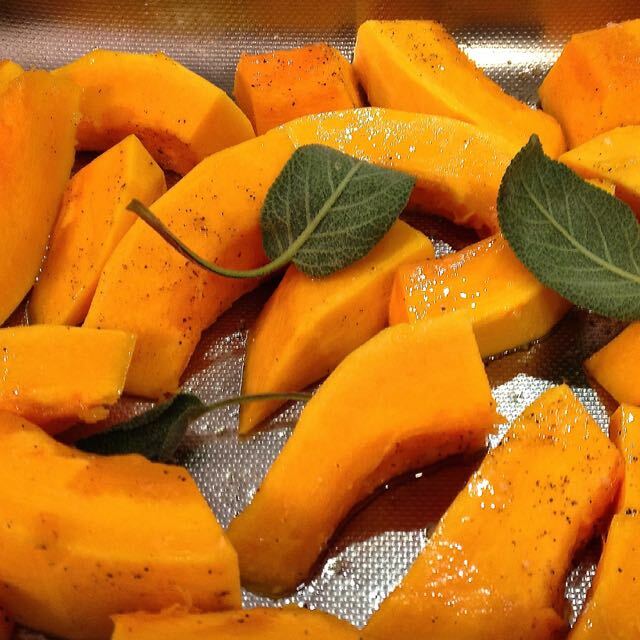 A few gratings of parmesan add a salty piquancy to the sweetness of the squash. This mixture can be made in advance and left in the fridge along with your home-made pasta - don't panic, pasta is easy. 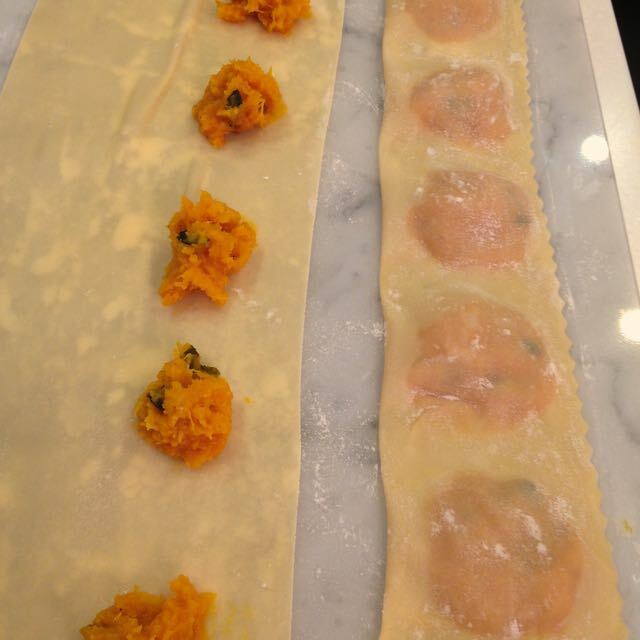 You can buy some decent fresh pastas but for ravioli you really need to make your own. You do need a hand-cranked pasta roller, or an attachment if you have a good electric mixer, but it's a purchase you will never regret. The only expensive ingredient in this recipe is the pinenuts but you could toast hazelnuts or cobnuts instead. Dressed with a smattering of toasted nuts, fried sage leaves, grated parmesan, and a slick of best olive oil, there's nothing like serving up a ravioli to make you look like a serious cook. The FILLING THE RAVIOLI section below is long as I've tried to be clear for the sake of those of you who have never made ravioli before. Once done, you won't need to refer to it again. You can carry out all of the following steps in advance right up to the COOK AND FINISH section. So, let's start with that scary pasta. Put all ingredients in a mixer, or use your fingers, to mix just until everything holds together. Either change to a doughhook and knead for 2 minutes or knead the dough on a work surface by hand for 10 minutes if you want an excellent work-out for your arm muscles (saves on gym fees). If you use a machine, knead the dough by hand for a final half minute (the warmth of your hands finishes it off perfectly). You will now have a smooth firm dough. Wrap it in cling film and allow to rest in the fridge for at least half an hour. Heat oven to 180C. Peel the squash (or leave peel on and remove it after roasting), cut it into quarters then each quarter into 2 or 3 pieces. Toss them in the tablespoon of olive oil with the sage leaves and roast in the oven on a baking tray for 20-25 minutes until soft and lightly browned. After about 10 minutes check the sage leaves and when crisp remove them to a bowl while the squash continues cooking - you don't want the sage to burn. Add the cooked squash to the bowl and mash or use a stick-blender to mix to a smooth paste flecked with sage leaves. Add cream if the mixture is very stiff, then parmesan and salt and pepper. Once cool, cover and refrigerate. Feed the pasta dough through the pasta machine on its lowest setting. Fold the dough and repeat 3 more times. Increasing the setting by one mark each time, feed the dough through the machine once until you reach its highest setting (if you are as short of kitchen space as I am you'll want to cut your rolled pasta in half part way through the rolling to make it more manageable, so you end up with 2 sheets of pasta). Sprinkle your work surface with a little polenta. Place your sheet(s) of pasta on a work surface and put heaped teaspoons of squash mixture just over half way across and 3cm apart. Use a pastry brush to paint the pasta lightly with water between the dollops of mixture all the way to the nearest edge and down that long edge. Bring the untouched half of the pasta sheet over to gently meet the water-brushed edge (don't press it down yet). Press down between the filling with the side of your hand to create separate pockets, easing the air out of the pockets as you go. You can now press down all along the edge. Neaten the edge with a knife, or pasta wheel if you have one, then cut to separate your filled pockets into individual raviolis. Sprinkle a tray or plate with the polenta and lay the ravioli on this in a single layer to stop them sticking together until you're ready to cook them. While you bring a large pan of water to the boil, lightly brown the nuts in a dry frying pan. Fry the sage leaves until just crisp in hot olive oil (takes just a few seconds) and drain them on kitchen paper. Once it comes to the boil, salt the water and add the ravioli. Bring back to the boil and cook for 3 minutes. 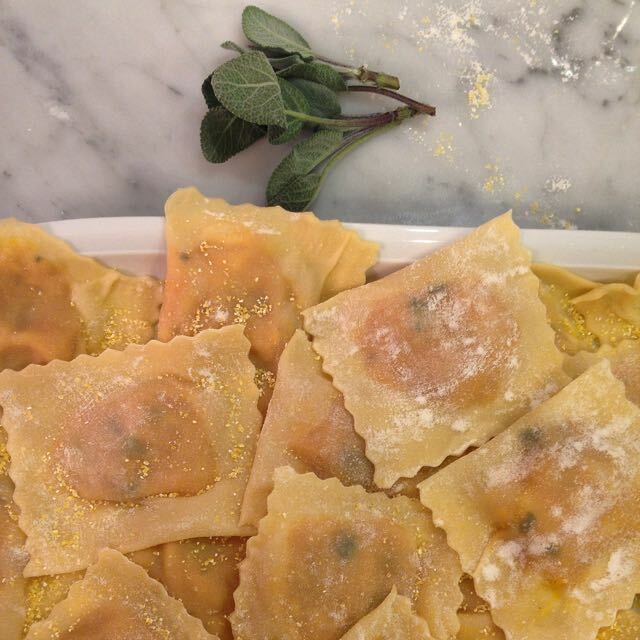 Remove the ravioli parcels gently to warmed plates (a little of the pasta water on the plate is a good thing), scatter the pinenuts, and crisp sage leaves over. Finish with a few gratings of parmesan and a drizzle of good extra virgin olive oil.